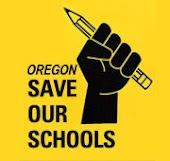 In January, Tom Olson, of Oregon Save Our Schools, put his research together to explain and summarize how Oregon's corporate education reform model came into being. The education reform plan was created swiftly with hand-picked voices and strategists, and the public's concerns and input were ignored. Hopefully, from reading this, Oregonians will realize that we are on the wrong path and demand changes to turn this around into a different and improved model that not only supports a well-rounded and quality-funded education plan but also includes the voices of teachers, parents, students, and community members. Today the House Education Committee listened to testimony around the effects of poverty in education with HB 2665 and HB 2867. Thanks to poverty expert Donna Beegle, Rep. Lew Frederick; and Steve Buel, Tom Olson, and Rex Hagans of Oregon Save Our Schools in providing excellent testimony in support of addressing the effects of poverty in our schools. Here is a link to the audio testimony for the record.